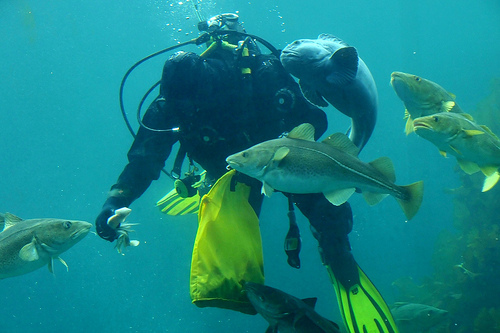 Is It Okay For Scuba Divers to Feed Fish? Scuba diving is an immersing and beautiful form of extreme sports. Being in the middle of an entire ecosystem that is often not thought about can be an exhilarating experience. Sometimes, it can be tempting to directly interact with and engage this ecosystem; its pristine beauty seems to beckon those who witness it. Nevertheless, certain interactions with the underwater environment can pose risks for both it and the diver. 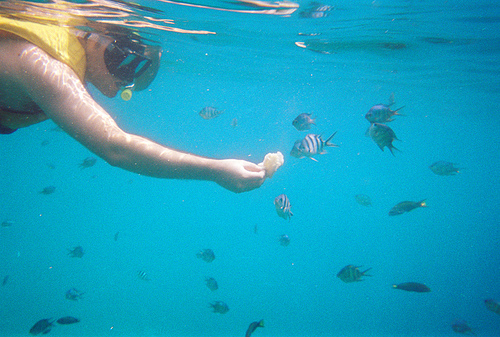 Read on to see why it is not acceptable for divers to feed fish and other aquamarine wildlife. When tourists and scuba divers alike engage in fish feeding, it diverts the fishes’ attention from their natural food source: reefs. Algae overgrowth will ensue which can kill the reefs if the feeding becomes routine or prolonged. Other fish, typically more aggressive ones, will then take over the reefs and use it for their food source, which leads to a decrease in biodiversity. All of this ultimately can spell disaster in a delicate ecosystem that naturally knows how to take care of itself. Fish do not need your help to eat; if you are scuba diving, leave them be and enjoy the beauty from a distance so that others who participate in this form of extreme sports can do the same. Fish are programmed to adapt quickly and feeding them in the wild causes them to change their feeding patterns quite quickly. Fish may end up harassing or even biting other people who are scuba diving because they have learned that humans = food. Many cases of bites and injuries have been reported from fish that have swarmed around a group of extreme sports divers and then moved in when there was no food to be found. The swarming effect by itself is dangerous for the diver: it can attract larger prey that want to get a bite of the action as well. Avoid these consequences for yourself and others by not feeding the fish. Depending on where you are scuba diving, feeding fish or any other wildlife could be illegal. In Hawaii, Egypt and a plethora of other countries, feeding the wildlife while diving is illegal. Many extreme sports clubs that sponsor scuba diving also prohibit their divers from engaging in this activity. These facts should discourage you from feeding underwater wildlife, if the aforementioned reasons have not already. Remember that the ecosystem is fragile, delicate and that these rules are in place for a reason. By now, you can clearly see why feeding fish while scuba diving is dangerous, harmful and in many cases, illegal. Whenever it comes to extreme sports, there are always rules and guidelines to follow and diving is no different. If you violate the ecosystem by feeding wildlife underwater, you may end up injured, in jail or in most instances, damaging the ecosystem as a whole. Keep your food to yourself and let the fish do what they do best: fending for themselves in their precious environment. Mother Nature will thank you for doing so. This entry was posted in Scuba Diving, Water Sports and tagged Ecosystem, Fish, Rules, Scuba Diving. Bookmark the permalink.